Savanna burning is about reducing emissions from fire by burning in the early dry season when fires are cooler and patchy. So far there are 71 savanna projects up and running which have received over 1.8 million credits. The 2015 method opens up savanna burning in the 600-1000mm rainfall zone with a sequestration method under construction. Seventy one savanna projects are currently approved with over 1.8 million credits issued. The first savanna project was approved by the Clean Energy Regulator in October 2012, the Fish River project in the Northern Territory. All up 22 savanna projects have been approved with Indigenous control or significant involvement. Covering the period to the end of 2015, 1.8 million credits have been issued to these projects at a value of around $30 million. Thirteen of them have won contracts under the government run Emissions Reduction Fund auctions to deliver 3.3 million credits over the next 10 years. 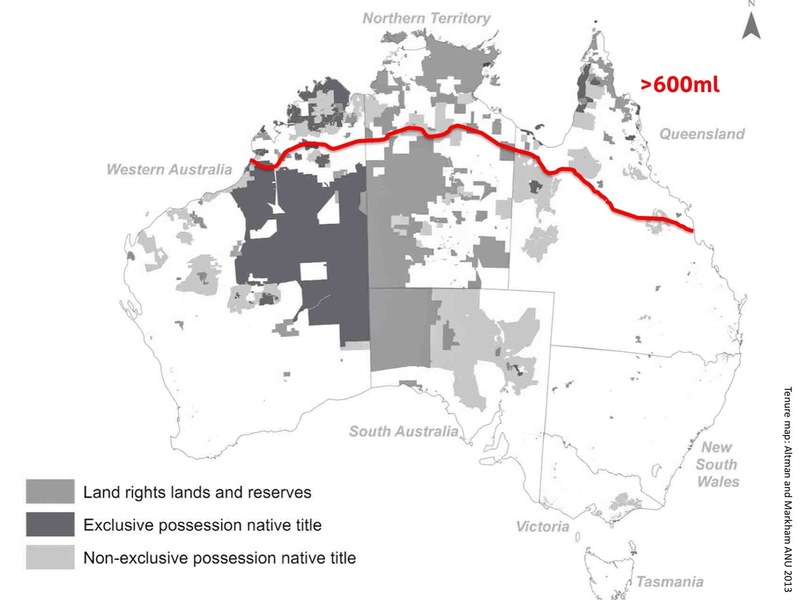 The rate of return for these projects currently works out to around $1 per hectare per year. Savanna burning is about reducing emissions from fire. Savanna fires release methane and nitrous oxide into the air, which are strong greenhouse gases. By burning in the early dry season when fires are cooler and patchy, and burning less country, there will be fewer emissions of these gases and an environmental benefit! Having good fire breaks can help to reduce the risk of hot fires spreading in the late dry season when the country dries out – reducing fire emissions is a lot about applying traditional patchwork burning. Reducing savanna emissions is like driving your car less – the less driving, the less emissions from your car exhaust. This is different to planting a forest, which takes carbon dioxide out of the air and stores it in trees. Savanna burning is an emissions reduction project, not a carbon storage project like tree planting. See the savanna factsheet for more information. 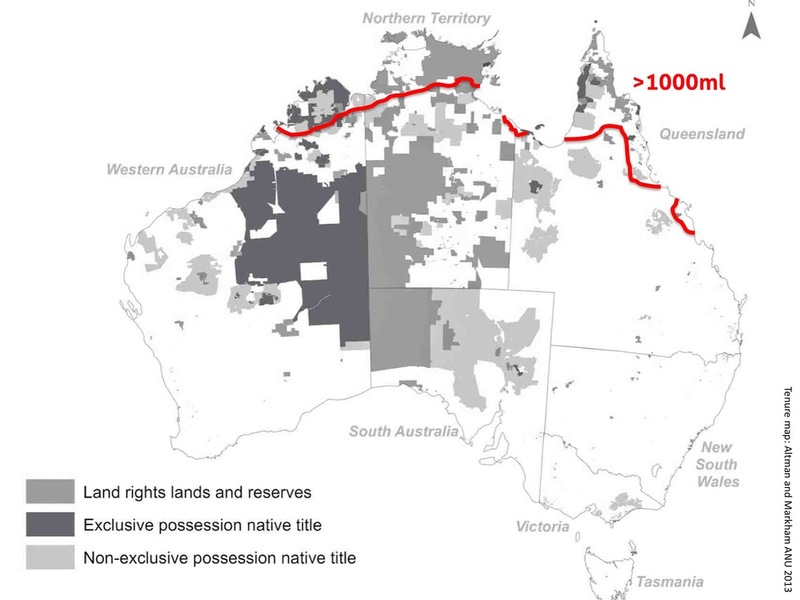 A CSIRO study by Heckbert et al 2008 estimated the potential of emissions savings on Indigenous land at around 2.6 MtCO2eq annually. This results from an overall annual emissions profile of 7.6 MtCO2eq with a potential reduction of around one third. Overall, the national accounts suggest about half of savanna emissions come from Indigenous lands. 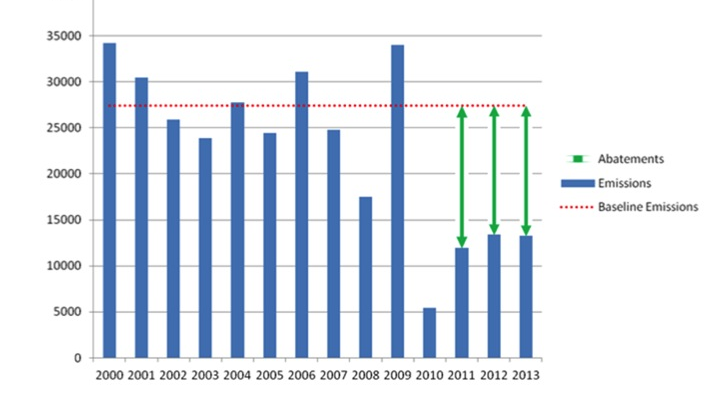 Methodologies record the rules for measuring emissions savings. The first savanna methodology was made in June 2012 and was one of the first methodologies passed. It only applies to shifting the time of year of burning to areas that receive over 1000mm of rainfall each year. 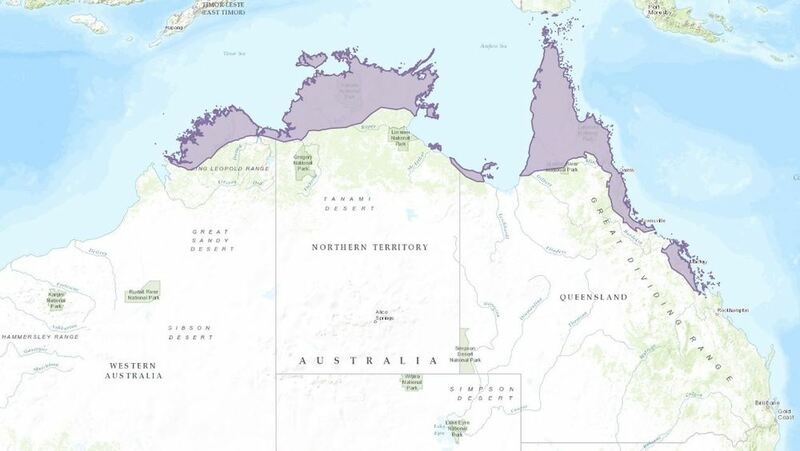 The methodology was developed by the Australian Government and the North Australian Indigenous Land and Sea Management Alliance (NAILSMA) with the help of traditional owners on the ground and $9 million from the Caring for Our Country program. Under the methodology, project owners need to develop a vegetation map for their project area – the methodology covers four vegetation types: eucalypt open forests, eucalypt woodlands, sandstone woodlands and sandstone heath. 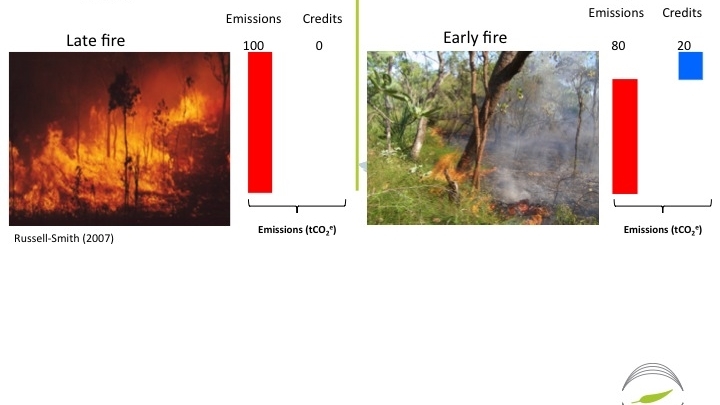 The different vegetation types generate different levels of emissions when they burn. Project owners must then determine the fire history of their project area for the last 10 years – this becomes the baseline or starting level. This relies on satellite maps provided by the North Australian Fire Information service or other services. Project owners can then implement a new fire management plan to shift burning into the early dry season. Carbon credits are given for the difference between the baseline emissions and the emissions under the new plan. A second savanna methodology was made in June 2013. This second version updates the burning efficiency table to include higher values and means more credits may be achieved. This version also makes other adjustments including when the late dry season may be declared to start and updating the reporting requirements. This document highlights changes between the first version and the second version. More information on the methodology is available here. A third savanna methodology was made in March 2015. This third version extends the existing methodology down to areas which receive over 600mm of rainfall every year. The methodology separates areas into two zones 600-1000mm and over 1000mm – there are different vegetation types and burning efficiency values for each zone. The vegetation types are as follows: for areas over 1000mm - open forest with mixed grass, woodland with mixed grass, woodland with hummock grass and shrubland (heath) with hummock grass; and for areas over 600mm - woodland with tussock grass, woodland with mixed tussock and hummock grasses, woodland with hummock grasses, open woodland with mixed grass and shrubland with hummock grass. The main changes are subtracting 10% of the credits into an 'uncertainty buffer' (to up to 5% of the baseline amount) to cover poor years, fixing the start of the late dry season at 1 August and allowing savanna projects in national parks. Extra flexibility is provided to allow splitting of project areas. Emissions reductions are likely to be less in the 600-1000mm zone because of lower fire intensity and prevalence of ineligible vegetation types such as grasslands, pindan and melaleuca. Given this new version of the methodology, the older versions have now been revoked meaning all new projects must use this methodology. Work is continuing on a sequestration version of the savanna methodology. Under the Indigenous Carbon Farming Fund Research and Development Stream, both the CSIRO and NAILSMA received funding to develop savanna fire management as a carbon storage activity – the current research is focusing on debris on the ground and is likely to generate more credits than the existing methodology. This new methodology might be finalised by the end of 2016. Spatial Information Systems Research Ltd received funding to develop the web-based Savanna Burning Abatement Tool version 2 (SavBAT2). SavBAT2 is ready to use and allows project owners to simplify use of the savanna methodology, in the same way that the Full Carbon Accounting Model (FullCAM) tool simplifies use of the environmental plantings method. In addition to fire scar data to develop project baselines, SavBAT2 also provides coarse vegetation layers which enables rough estimates of abatement potential on savanna landscapes. A very nifty tool that can be accessed online. Savanna burning earns 'Kyoto compliant' carbon credits because the emissions from savanna burning count towards Australia's national account under the Kyoto Protocol. The second commitment period of the Kyoto Protocol covers 2013-2020.